Thanks, Kim! We appreciate it. We hope they are reading this very letters page! We don’t hear nearly as much about early Dutch settlers in the colonies as we do early English settlers, it seems. Next time we discuss the United States’ colonial period, we’ll certainly keep that in mind! I am particularly touched by those in prison who write and you publish their letters. It’s a wonderful magazine and over time I will gather lots of information to share with others. It’s incredibly well written, and although I get behind in my reading, I do endeavour to devour every word. A big thanks to the team. 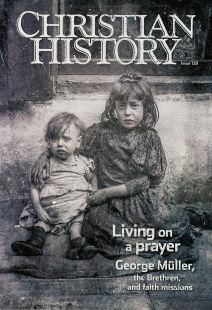 I’m delighted to receive Christian History and usually read it from cover to cover. Let me call your attention to one matter in your recent issue on “Baptists in America.” Several times this issue refers to Lott Cary, a Baptist minister in Tidewater, Virginia, during the early 1800s who went as a missionary to the colony in West Africa later known as Liberia, and who was ably serving as governor there when he died in 1828. Twice on page 18 this notable African American is correctly referred to by name. Elsewhere, however, his name has regrettably been misspelled. During Cary’s own lifetime a Baptist deacon in Richmond, Cary’s personal friend and colleague, wrote a letter to the editor of a Christian periodical, giving a gentle reproof for changing the way Cary invariably spelled his own name—Lott not Lot, Cary not Carey. How to spell Lott Cary’s last name was a source of discussion throughout our preparation of the issue, given that his National Park Service plaque (pictured in the magazine) gives it as Cary, but modern authors generally spell it as Carey. Since the mission society named after him (http://lottcarey.org) spells it Carey, we chose to go with Carey. Prompted by your letter, we did some further research, which confirms your account and suggests the misunderstanding arose originally because printers assumed that his name was spelled the same way as Rev. William Carey who was contemporaneous with him.